The Manitou Day Pack is a mid-sized member of Granite Gear's Campus Collection. 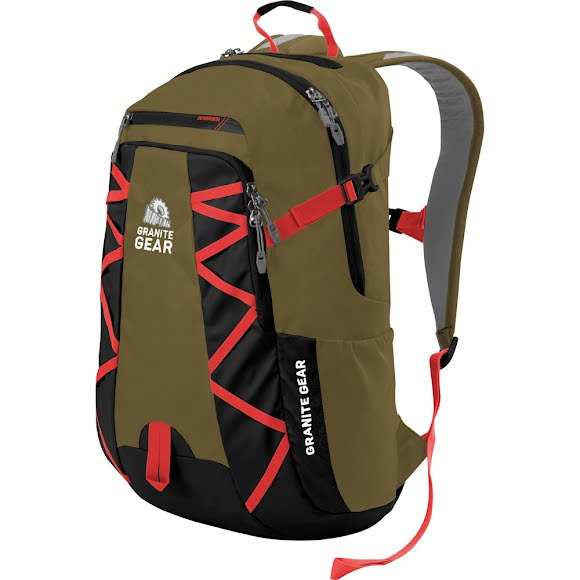 And as such, it's designed to be the ultimate pack for day-to-day use. It achieves this with the impressive durability, weather resistance and comfort that is a Granite Gear staple. The source of these characteristics is quality workmanship and innovative, weather resistant materials like repelaweave and taurpalite. The Manitou Day Pack is a mid-sized member of Granite Gear&apos;s Campus Collection. And as such, it&apos;s designed to be the ultimate pack for day-to-day use. It achieves this with the impressive durability, weather resistance and comfort that is a Granite Gear staple. The source of these characteristics is quality workmanship and innovative, weather resistant materials like repelaweave and taurpalite. It is designed tall and slim, to keep the load close to your center of gravity and facilitate packing awkward items like textbooks, binders and laptops. The main compartment is perfect for these larger items, while an organizer in the front pocket keeps smaller things from getting lost. External storage options include dual stretch mesh side pockets, and webbing attachment points. The Manitou also features a 17" padded laptop sleeve and a Barrier zippered, tricot-lined quick access pocket. With features like these, you can carry your electronics and valuables with confidence. The Trail-tested load carrying technology found on the Manitou is plush, and features load absorbing shoulder straps with ventilation cut-outs as well as a raised, foam back panel. Performance features like a sternum strap and minimalistic waist belt help to stabilize the load when necessary. Overall, the Manitou is a great option for an everyday pack. It grants ample storage and organization options, protects your valuables and is constructed tough enough to withstand the test of time. For the commuter, the student or the everyday adventurer, it&apos;s hard to find a better pack.